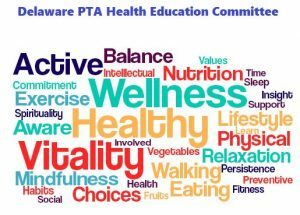 The purpose of the Delaware PTA Health Education Committee is to promote awareness and provide programs concerning health and safety issues that affect the child. Examples include: promote activities and programs around health and safety issues, keep families informed on important health and safety issues in your area, participate in National PTA’s Healthy Lifestyles month activities, work with families, local businesses and the community on a variety of health and safety programs. Delaware State PTA supports the health and well-being of all children and youth as a contributing factor to academic success and overall quality of life. Delaware State PTA, in conjunction with National PTA believes that comprehensive health education is essential for each child to develop to his fullest potential. Comprehensive health education includes physical, mental, emotional, and social well-being. Education and awareness of the dangers of drug use. The Delaware State PTA will partner with community organizations, schools, and districts to ensure all students have access to A comprehensive health education curriculum and/ or program that engages the family & community.